It is that time of year when the retailers release their sales numbers for the six weeks leading up to Christmas. Like enthusiastic disciples making a pilgrimage to the Temple of Delphi, such numbers are seen as an indicator of the strength of consumer spending, the UK economy and whether the strategies of the respective companies are on track or not. A heavy burden for a single number to carry! Often some poor unsuspecting retail expert is dragged into a television studio to offer “profound insights” into the health of the retail sector – largely on the basis of a number that, amongst other things, takes no account of the capital required to generate that number. Indeed Tesco, following on the heels of Morrisons and Sainsbury earlier this week, announced their year-on-year sales progress – amounting to a 0.7% sales increase for the six weeks ending on the 7 January 2017. It is an interesting comment, resting on the in-going assumption that “recovery” and the scale of market share are natural bedfellows in all contexts. Whilst potentially beguiling from a shareholder perspective, it is in serious danger of forming only one half of a rather more complex story. Therefore, MVA represents the market’s collective view of the future stream of economic profits at a given point in time for a given share price. Enterprise value is calculated as the market capitalisation plus debt, minority interest and preferred shares, less total cash and cash equivalents. Invested Capital is defined as Total Assets less short-term non-interest bearing liabilities. By subtracting one from the other we get a perspective on the capital market’s view on the Tesco recovery. The following calculations have used the data available, principally the company’s balance sheets, at the relevant time; the most recent calculated numbers for January 2017 use the 2016/17 half-year balance sheet which is not ideal but it is the latest set of available data. We have chosen 21 July 2014 as this was the point when the previous CEO, Mr. Philip Clarke, was replaced. The share price at this chosen time was £2.8865. Indeed, the exercise above proves the validity of looking at the MVA position rather than the more commonly-viewed market capitalisation approach. Although market capitalisation has fallen by £3.427bn between 21 July 2014 and 28 Feb 2015, the reason why this is so is principally due to the decline in the Invested Capital balance, which fell by £5.162bn. 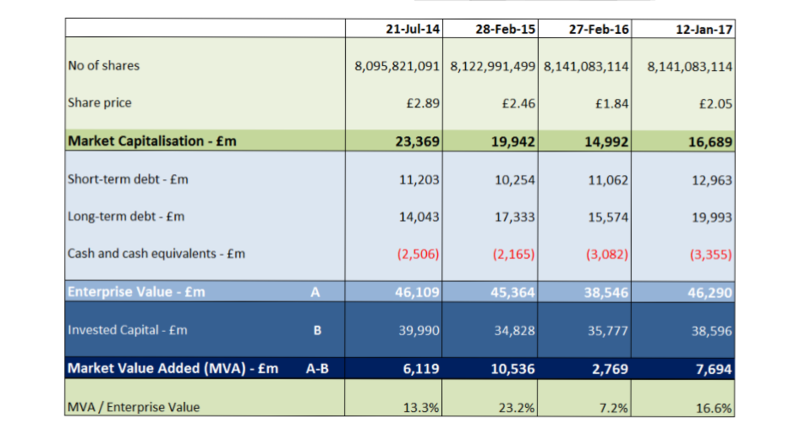 MVA, the market’s view of the future stream of economic profit, rose by £4.417bn (ie £10,536m-£6,119m). Unfortunately, it can be argued that the recovery has somewhat stalled despite the recent rise in the share price. Although clearly better than last year, current MVA based on the last half-year (2015/16) balance sheet – and a share price of £2.05 – stands at £7.694bn, which is £2.842bn less than the MVA balance of two years ago (£10.536bn) when the “new” strategy was announced. The company may have convinced several analysts that it has a value-maximizing strategy for shareholders but let us not forget that analysts may not adopt the same collective view as that of the capital markets and from our calculations and from the share price performance, it would seem that the “recovery” is not as established as some would have you believe.